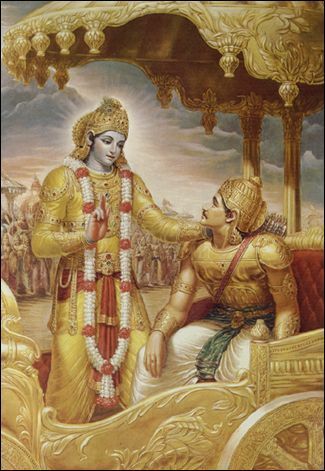 Kṛṣṇa tells Arjuna that he should act in yoga. And what is that yoga? Yoga means to concentrate the mind upon the Supreme by controlling the ever-disturbing senses. And who is the Supreme? The Supreme is the Lord. And because He Himself is telling Arjuna to fight, Arjuna has nothing to do with the results of the fight. Gain or victory are Kṛṣṇa's concern; Arjuna is simply advised to act according to the dictation of Kṛṣṇa. The following of Kṛṣṇa's dictation is real yoga, and this is practiced in the process called Kṛṣṇa consciousness. By Kṛṣṇa consciousness only can one give up the sense of proprietorship. One has to become the servant of Kṛṣṇa, or the servant of the servant of Kṛṣṇa. That is the right way to discharge duty in Kṛṣṇa consciousness, which alone can help one to act in yoga. When the yoga performance is described, it is said that Kṛṣṇa’s name is yogeśvara. No one can be a better yogī than the master of yoga, and Kṛṣṇa is the master. There are many different types of yoga. Yoga means the system, and yogi means the person who practices that system. The object of yoga, the ultimate goal, is to understand Kṛṣṇa. Therefore, Kṛṣṇa consciousness means to practice the topmost type of yoga. Yoga means to get into touch with the Supreme Lord. The process, however, includes several bodily features such as āsana, dhyāna, prāṇāyāma and meditation, and all of them are meant for concentrating upon the localized aspect of Vāsudeva represented as Paramātmā. Paramātmā realization is but partial realization of Vāsudeva, and if one is successful in that attempt, one realizes Vāsudeva in full. But by ill luck most yogīs are stranded by the powers of mysticism achieved through the bodily process. If you indulge your senses unrestrictedly but make a show of yoga practice, you will never be successful. The senses cannot be controlled in the proper sense of the term; they are always agitated. This is true also with a child—how long can he be forced to sit down silently? It is not possible. Even Arjuna said, cañcalaṁ hi manaḥ kṛṣṇa: “The mind is always agitated.” The best course is to fix the mind on the lotus feet of the Lord. Mano mayy arpitaṁ sthiram. If one seriously engages in Kṛṣṇa consciousness, that is the highest perfectional stage. All Kṛṣṇa conscious activities are on the highest perfectional level of human life. Yoga means concentration of the mind detached from all other subject matter. And actually such concentration is samādhi, or cent percent engagement in the service of the Lord. And one who concentrates his attention in that manner is called a yogī. Such a yogī devotee of the Lord engages himself twenty-four hours daily in the service of the Lord so that his whole attention is engrossed with the thoughts of the Lord in ninefold devotional service, namely hearing, chanting, remembering, worshiping, praying, becoming a voluntary servant, carrying out orders, establishing a friendly relationship, or offering all that one may possess, in the service of the Lord. 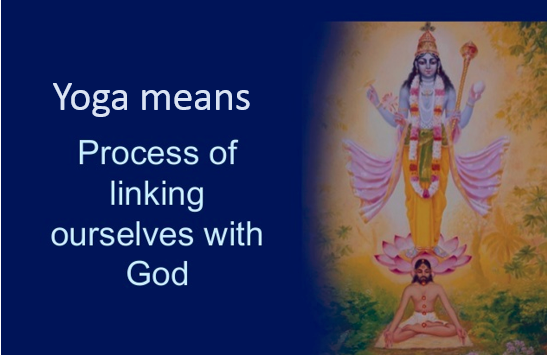 By such practice of yoga, or linking up in the service of the Lord, one is recognized by the Lord Himself, as it is explained in the Bhagavad-gītā concerning the highest perfectional stage of samādhi. The Lord calls such a rare devotee the best amongst all the yogīs. Such a perfect yogī is enabled by the divine grace of the Lord to concentrate his mind upon the Lord with a perfect sense of consciousness, and thus by chanting His holy name before quitting the body the yogī is at once transferred by the internal energy of the Lord to one of the eternal planets where there is no question of material life and its concomitant factors. In material existence a living being has to endure the material conditions of threefold miseries, life after life, according to his fruitive work. Such material life is produced by material desires only. Devotional service to the Lord does not kill the natural desires of the living being, but they are applied in the right cause of devotional service. This qualifies the desire to be transferred to the spiritual sky. General Bhīṣmadeva is referring to a particular type of yoga called bhakti-yoga, and he was fortunate enough to have the Lord directly in his presence before he quitted his material body. He therefore desired that the Lord stay before his view.